For a millennium, the Children of Amarid have served the people of Tobyn-Ser. Drawing upon the Mage-Craft, which flows from the psychic bond they forge with their avian familiars, the Mages of the Order have fulfilled their oaths by healing the injured and ill, repelling invasions by the land's enemies, and caring for the people in times of crisis. They are governed by laws handed down by Amarid, the first of their kind, who committed the Mage-Craft to the people's protection. Only once in a thousand years has a mage defied those laws. Theron, a contemporary of Amarid, sought to use his powers to gain wealth and glory. For that, he was punished, although not before he brought down a terrible curse on his fellow mages and all who would come after them. Recently, dark rumors have spread across Tobyn-Ser. Children of Amarid have been seen destroying crops, vandalizing homes, massacring men, women, and children. Have the mages forsaken their oaths? Has Theron returned from beyond death to take his vengeance? Or does Tobyn-Ser face a new threat, one it is ill-prepared and ill-equipped to face? With the land in turmoil and faith in the Mage-Craft badly shaken, it falls to Jaryd, a young mage with extraordinary potential but little knowledge of the power he wields, to find and destroy Tobyn-Ser's enemies before they destroy all he holds dear. 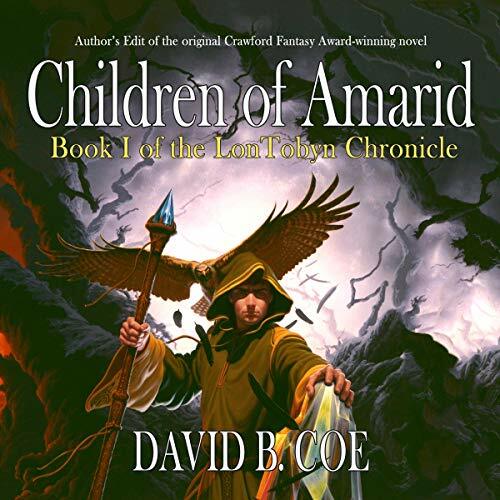 Children of Amarid is the first volume of the LonTobyn Chronicle, David B. Coe's Crawford Award-winning debut series. In this generic fantasy romp the likeable but unremarkable characters fight a threat from beyond.